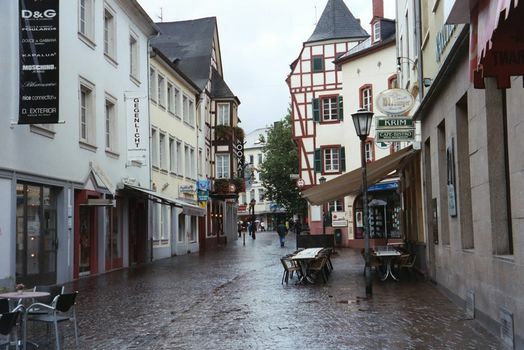 Trier (in English Treves, pronounced Treeves) has a venerable core for the very good reason that the town began as Augusta Treverorum, "the August City of the Treveri." 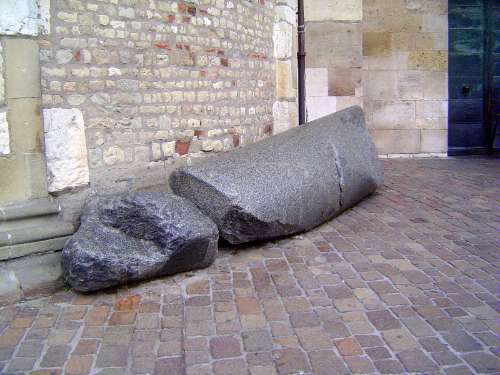 It was established about 17 B.C. and took its name from the local, conquered Treveri. Romans in need of liquid consolation introduced vineyards in the second century, and in the fourth century the local wines were celebrated by the poet Ausonius. (The nearby hills are still clad in vineyards.) For more than a century, this was an imperial capital and the occasional residence of emperors including Constantine. By 418, however, the Roman administration had decided that a prudent respect for barbarians dictated a move south to Arles, and by 459 the city was in uncouth but at least Christian hands. Ready for a peek? The Roman street plan was a customary tidy grid about 15 blocks by 7, with a forum at the center. It remained intact until a Viking invasion of 882 destroyed the city so completely that even the street plan was mangled and eventually replaced by a more random layout in which only bits of the old grid survive. In the 20th century a new kind of barbarian arrived, and the city acquired districts that only a quantity surveyor could love. Another hint of the old street grid. 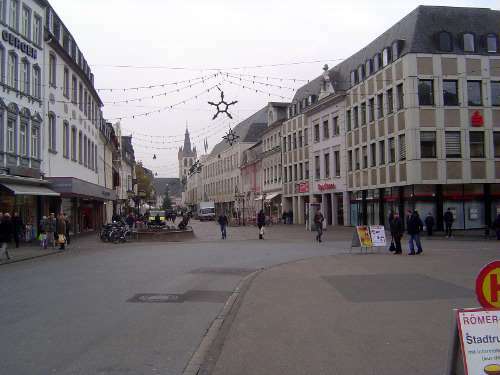 The Hauptmarkt was operating by 958. Behind it is the steeple of St. Gangolf, consecrated just the other day, in 1459. 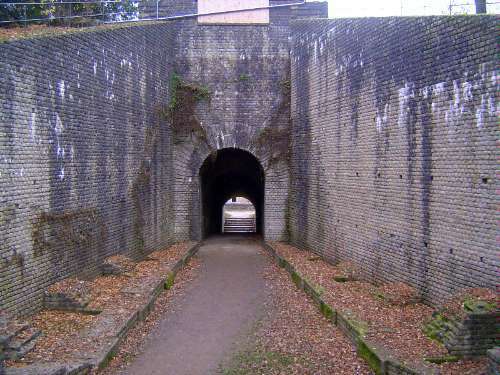 The Roman city was wrapped by a 4-mile wall enclosing an area slightly over one mile square. There were five gates but only this one, the Porta Nigra, survives, presumbly because it became a hermitage in the 11th century and later a church. It's almost intact--buy a ticket and you can wander around inside. 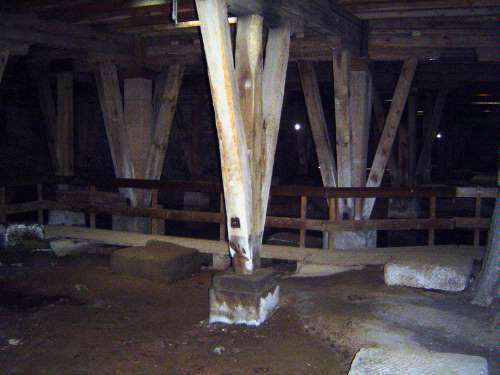 The left side lost a floor during the building's church incarnation. 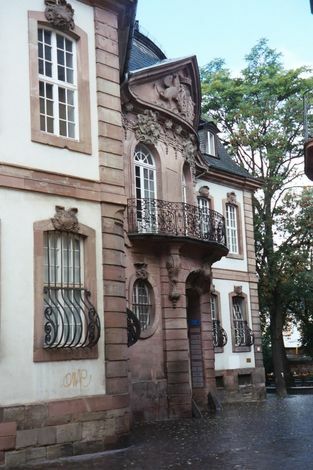 At the base, two archways lead into the city. In a testimony to the power of the Pax Romana, gates were never installed or needed until it was loo late for them to do any good. 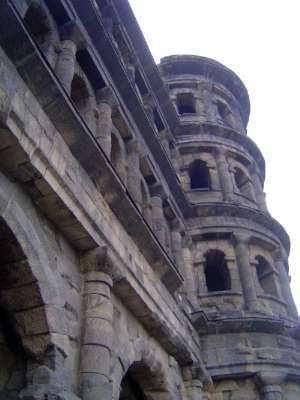 The structure itself is of unmortared sandstone--gray despite the name "black"--clamped together like Rome's Colosseum. 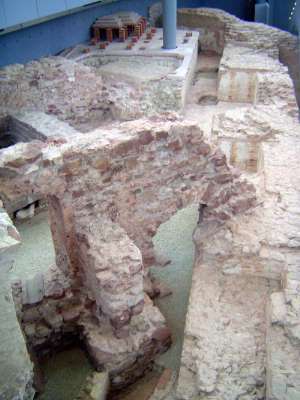 Not far away, archaeologists have dug down and found more Roman relics, now kept under glass. Bricks in aspic. 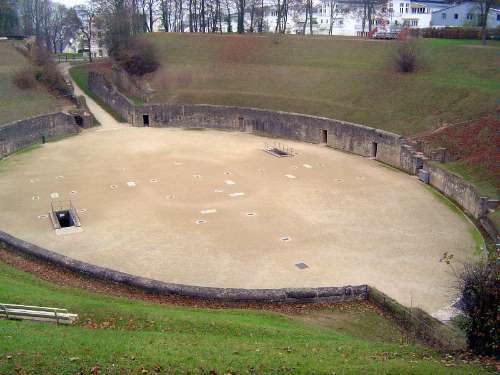 The Romans needed their amusements, in this case an arena. A tunnel to the arena floor. Below the arena is a dank basement, reminiscent of the tunnels under the Roman Colosseum. 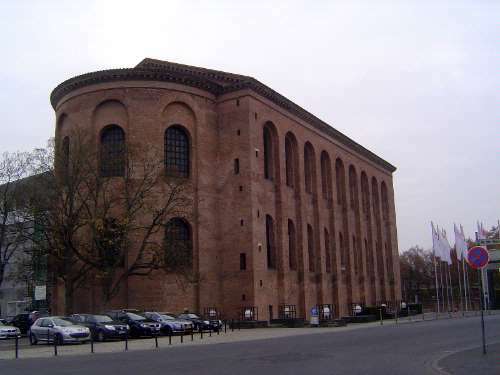 Here is perhaps the city's most extraordinary building, now a church but originally a basilica begun by Constantine and completed by Gratius (367-383). 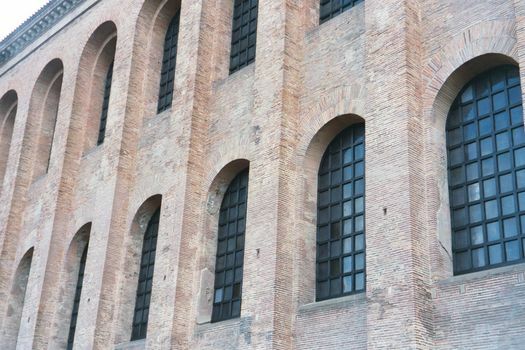 Originally part of the imperial palace, it was faced with plaster mixed with bits of chipped brick to lend color. The plaster's gone, but the building's dimensions remain very grand: 236 by 108 feet. The windows are much bigger than you'd think: 12 feet by 24. The bricks are thin, not at all like the bread loaves used today. 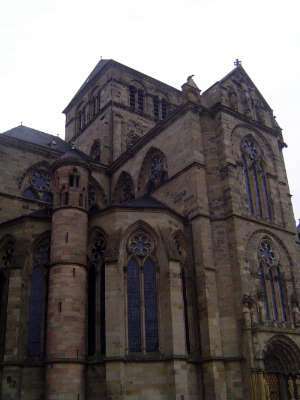 The archbishops of Trier controlled the basilica, and about 1600 one of them began building an adjoining palace. This is its south wing, designed about 1760 by Johannes Seiz, a student of Balthasar Neumann, designer of the world's happiest buildings. In a pagan echo, the central projection includes figures of Pomona, the fruit goddess, and Ceres, goddess of grain. The entrance to the basilica is now through the understated door on the left. 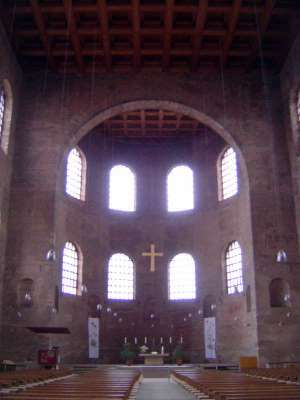 The interior, with the apse in what was originally a throne space. The roof is a 19th century replacement. It's hard to know where to put the odd bit of Roman leftovers. At least you don't have worry about souvenir hunters. 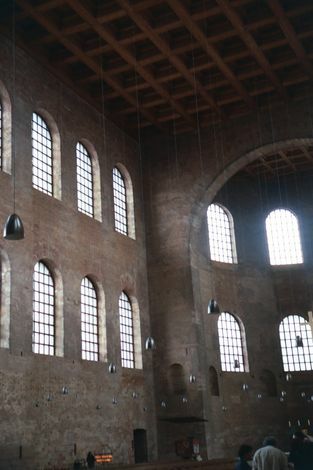 Christianity here goes back to an enormous church built after Constantine's Edict of 313. 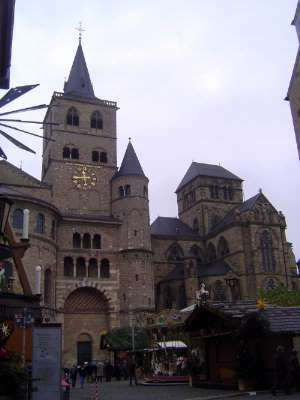 That church was eventually destroyed by the Vikings, but another cathedral--this one, called Trier Cathedral or the Cathedral of St. Peter--was built on the site. It remains Germany's oldest, despite the clock, above which a Latin phrase reminds us that we can't be sure when the world will end. 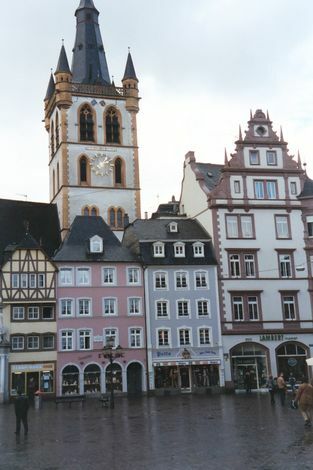 On the right is a separate and perhaps more unusual church, the Church of Our Lady, started in the 12th century. 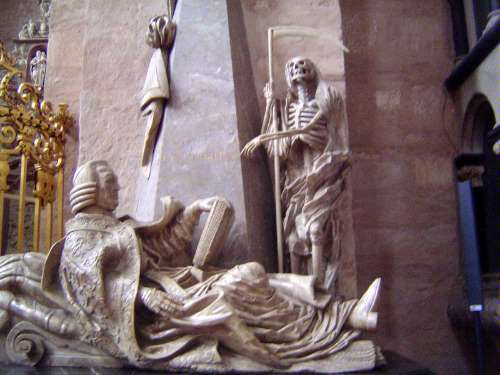 Momento mori: a skeleton in the cathedral mocks the living. 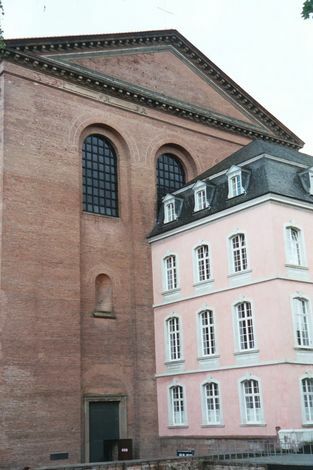 The adjoining Church of Our Lady replaced a pre-Romanesque parish church. "The floor plan... is nothing less than amazing," writes Norbert Nussbaum in German Gothic Church Architecture,, 2000, p. 42. The high tower in the picture marks the crossing. 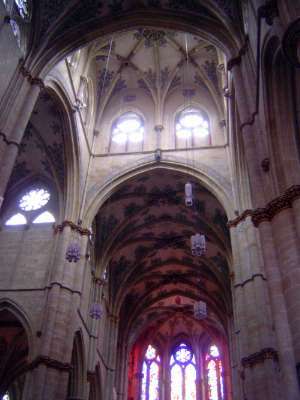 The short nave is on the right; a transept is on the left. In each of the four corners there is a chapel, like the one seen here, which rises to the clerestory windows of the nave. The interior space approximates a rotunda with lots of corners. 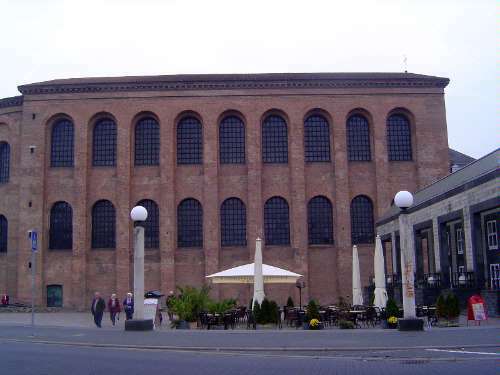 Nussbaum throws cold water on the "modern theory [that] has proposed that its design was a project of the Archbishop of Trier at the time,... striving to build a church in Trier that would carry associations of imperial grandeur equal to Charlemagne's Palatine Chapel in Aachen." Still, the builder was ambitious enough to be innovative. 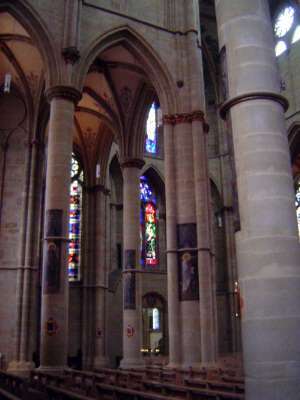 A view of one of the chapels that, together, make the interior almost a rotunda. 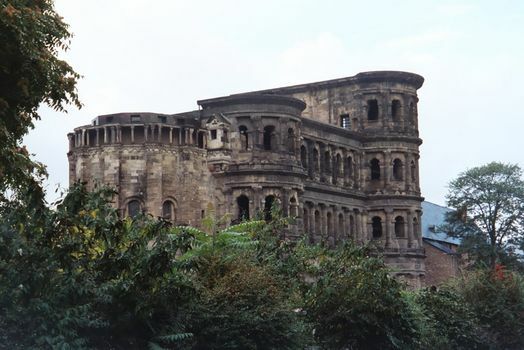 As in Rome, wealthy residents of Trier found it advisable during the Middle Ages to live behind stout walls. 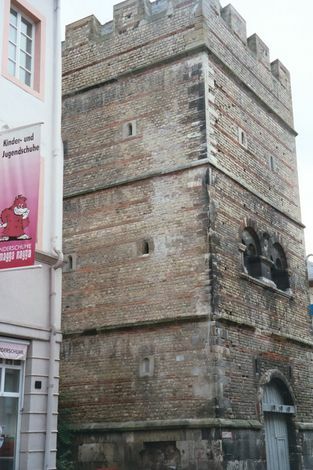 Here's the hospitable home of Franco von Senheim, who lived in this 11th century tower, the Frankenturm, entered in his day by climbing a wooden ladder to an upper level. Call it an anticipation of gated communities. You can never be too safe. By the 1740s residents felt a bit safer. 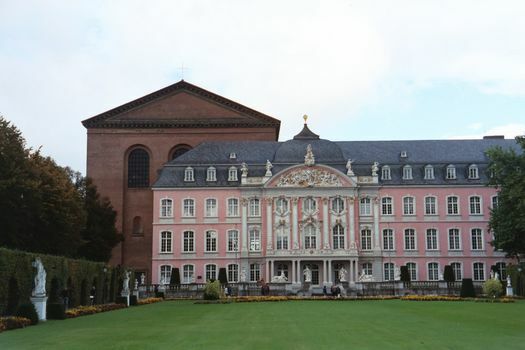 This is the Kesselstatt Palace, built at that time for Count Kesselstatt. The facade includes a rounded gable to follow a curve in the warped grid of the city's streets.